IN UTERO is a powerful new documentary on what will emerge as the most provocative subject of the 21st Century – life in the womb and its lasting impact on human development, human behavior, and the state of the world. It dives deep into the newly emerging field of epigenetics and what it means for our understanding of fetal development and the impact of generational trauma. It’s a truly powerful film that will lead you to deep questions within yourself and of our deep historical interconnectedness. IN UTERO brings together for the first time convincing data that explains why some of us face challenges from the start while others thrive. Prepare to be surprised, intrigued but no longer baffled by what the future holds for yourself, your loved ones, and the human race. This documentary is PG-13 and runs for 85 minutes. Exclusive first time screening in Hong Kong, jointly sponsored by AFHK Adoptive Families of Hong Kong and Mother’s Choice. 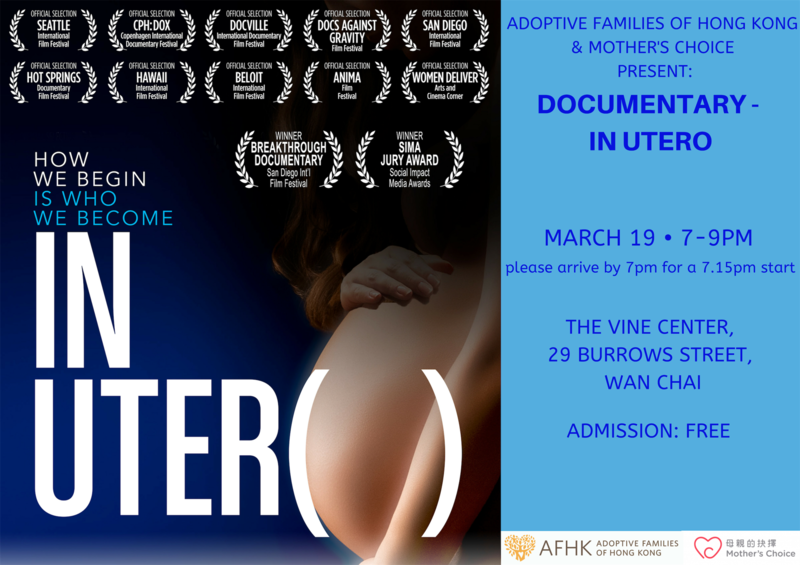 Following the screening, there will be a general discussion with questions and answers for approximately 20 -30 minutes that will be led by Dr. Erica Liu Wollin from AFHK, and Chrissy Wong from the Adoption Unit at Mother’s Choice. This event is free of charge and is open to all, but limited spaces available. Admission is only by advanced registration at this link . We are able to screen this high quality film through the generosity of donors. Should you wish to help cover administrative costs, we very much appreciate your donation. In the event of inclement weather and a Black Rain or Typhoon 8 warning is hoisted this event will be cancelled. Please check AFHK's website for updates. All registration is final and no refunds or credits will be given, except in cases of cancellation due to weather.